For Sound Week in Dunkirk, I received two commissions from the city, of which one was to compose a piece for electric guitarist Valentin Carette, a truly excellent musician that deserves to be world famous and whose music you should listen to immediately by clicking on his name. 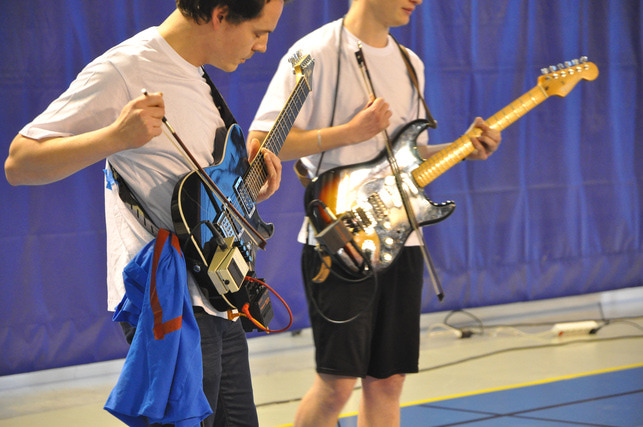 The piece, written as a set of rules for a musical sport, pits two teams of electric guitarists against each other. I was the referee for the inaugural game in which the team from Rosendael eeked out a victory against the team from Grande Synthe. The piece was premiered in the Salle des Sports du Grand Large in Dunkirk.